This was one of my favourite collections at Copenhagen fashion week. Simply because IVANAhelsinki knows how to make dresses that girls want to wear! Her clothes struck an inspiring balance between structure, proportion and femininity. The collection flowed with great ease and still managed to show a broad range of influences. The Finnish designer’s Victorian references, 1980s skirt lengths and puritanical shapes worked together seamlessly. The structured shoulders and muted prints were are great Nordic take on the current trends in fashion. It was ethereal and charming. The snowy runway was a nice effect. 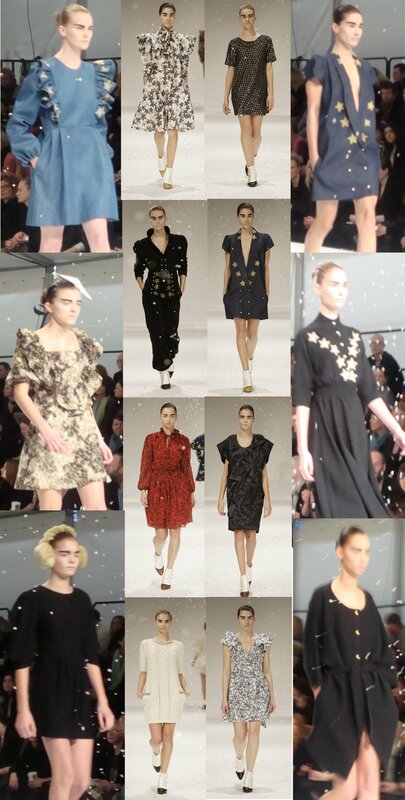 One of my favourite pieces was the over-sized blazer dress with the dropped waist and starry lapels. I want to own it! Apparently, IVANAhelsinki is the only Nordic designer invited to show at Paris fashion week. So we can expect great things from her in the future. To find out more about the designer please go to her website and to view the entire collection click here. I’m still feeling under the weather, so will have to add my favourites from Copenhagen Fashion Week over the next few days. Image credit: My own and Copenhagen Fashion Week. This entry was posted in Fashion and tagged Copenhagen Fashion Week, Fashion, IVANAhelsinki. Bookmark the permalink.